Scores from the: 98 more miles tomorrow? Are you kidding me? bike tour. Larry, Rob and Mike F. coming down to ride with me: Thanks guys, it was great. They drove to Marysville and rode the route backwards meeting us about 25 miles from the hotel. Mike F. complaining after he had ridden a total of 50 miles about cramps and soreness: Does anything need to be said? Making a wrong turn at a detour: Ugh. Jim taking a picture at a farm and touching an electric fence: Ouch. Seeing the Amish on the way to Church riding in their carriage and on bikes: Neat, the bikes draft the horse and carriage. 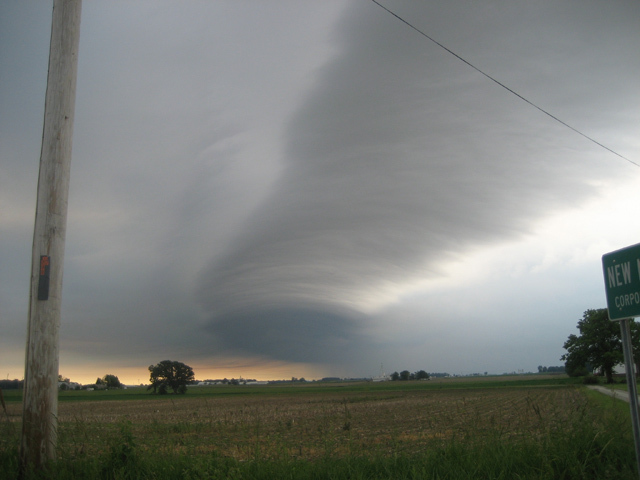 Cold Front: We watched a cold front move through Ohio with clouds I have never seen before. We could see a storm rotating. The wind: Larry swears the wind shifted to be in our face after they met us. 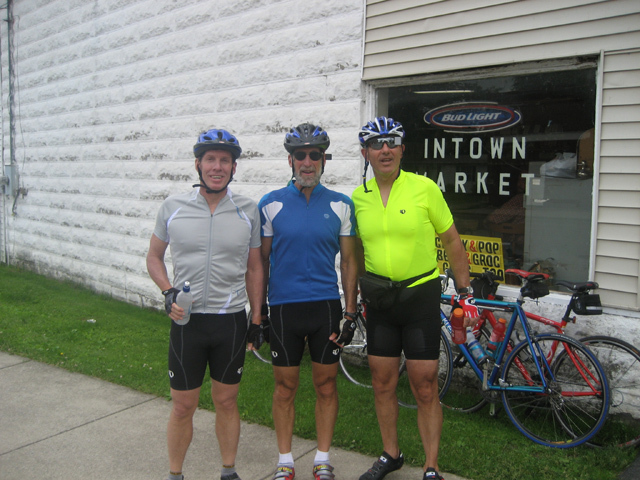 Jim, Peter and I rode out knowing we had four tough days in front of us. 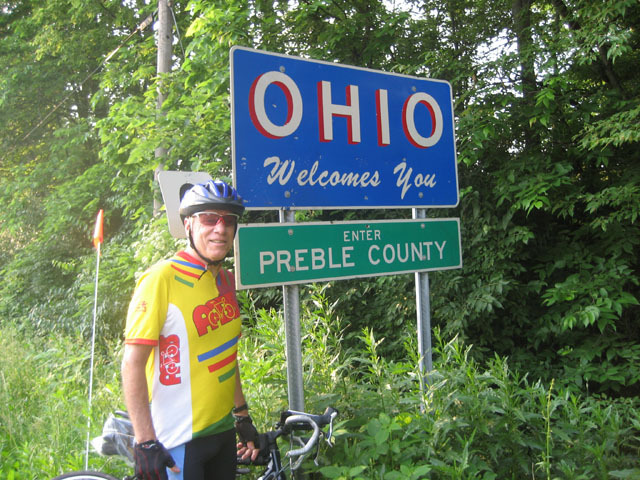 We took our time, took lots of pictures, made a wrong turn at a detour, and had a pleasant ride on a good riding day. Chris and Willie had decided to ride with our mechanic and his buddy. I consider this a decision to be similar to the Captain of the Exxon Valdez made in going to the bar before he left port. Not a good idea. We will see in the following days. 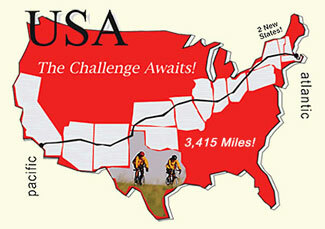 We met Larry, Rob and Mike about 25 miles out and they got an idea of what a cross country ride was about. Nice riding but tiring. Thanks again guys. I would have thought most pelope in Kansas were better than that, but is in the east part. In the northwest they wave at you in some parts even if they don't know you. Have a wonderful finish to your trip. yeah that does look like larry??! !welcome to storm country. In 1974 in april we had 174 storms. If Jim's problem is a specific saddle sore, get some Dr.Scholl's corn and callous pads (theyr're ring shaped); stick as many together as he needs to keep the pressure off; place over the problem area; fill the donut hole with first aid cream. Nothing is perfect, but it should help. Ride on, brother. Hey Al - I have good news for you! A suggestion for toches relief. A friend told me today that she knew a guy who was a biker and he found that putting a sanitary pad in this shorts really helped. Let me know how it works for you. Great pics - and to answer your rhetorical question, VERY cool. Glad Larry witnessed the Al Wind Effect - Simply Heads Into Trouble (AWE - you figure the acronym).